Access to the track at the south end of the Dusky (Lake Hauroko Burn) operates every Monday and Thursday only. 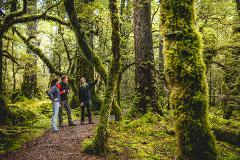 So you are best to start here and walk south to north, ending at West Arm, Manapouri. We collect at 7.30 am from your Te Anau accommodation, or if you have access to a car you may wish to leave it at Manapouri (where you get off the track) and we would collect you from here at 8.00am. From here we transport you overland to Clifden corner to connect with Lake Hauroko Tours. They then transport you across the lake to the start of the track, arriving around 11.00 am. To get off the track at West Arm there are many departures everyday across Lake Manapouri with Real Journeys. They do not take bookings (so they do not have to worry about missing, delayed or otherwise trampers), you just turn up and catch the next available boat. The scheduled boats are at 11.00 am, and 5.00 pm. These departures specified have connecting buses to Te Anau if required. We can issue an open dated ticket for this portion of travel if you wish, otherwise you just sort it out when you get there.